Can you guess what has popped up as one of today’s most concerning health hazards? We are all exposed to it every day. It’s not a contagious virus or bacteria but it’s more frequent than the common cold. It’s called “blue light” and scientists are warning us that it poses very serious risks to our eyesight. Blue light is that ubiquitous aura that constantly emanates from the screens of our various electronic devices. We are bombarded with it. 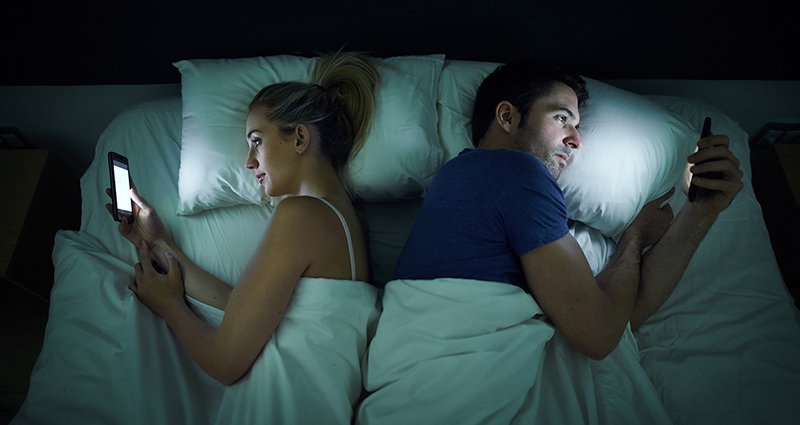 Our cell phones, tablets, TVs, laptops and interior LED lights emit this perpetual glow that we now know, with absolute certainty, wreaks havoc on our eyes and vision. Even more prevalent than sunlight exposure, blue light has emerged as the foremost threat to our vision, by penetrating and damaging the retina and other parts of our eye. Blue light exposure significantly increases our risk of developing age-related macular degeneration, the leading cause of blindness in older adults. There are ways to combat blue light damage. Limiting your screen time is your best option, but if that is not possible then take measures to reduce exposure to the blue spectrum. There are apps for electronic devices, low blue light emitting light bulbs and screen filters that can reduce the amount of blue light emitted. If you suffer from sleep problems or have a strong family history of degenerative eye conditions, it is worth considering your overall lighting environment. There are special pigments, lutein and zeaxanthin, found in our eyes that can filter blue light. They do a remarkable job of protecting our macula. Lutein and zeaxanthin are carotenoid pigments found in our diet, especially in leafy greens such as kale, spinach and collard greens. These carotenoids neutralize blue light and protect our macula. A newer addition to the battle against blue light is another carotenoid compound called astaxanthin. Astaxanthin is found in relatively low amounts in our diet. Astaxanthin is a remarkable compound that is 4 times stronger than lutein. Blue light is quickly becoming recognized as a leading threat to our health. It is dangerous because it creates problems gradually and we are exposed to levels we have never seen before. New threats require innovative approaches. Supplementing our diets with astaxanthin, lutein and zeathanthin to ensure adequate protection, making changes to your environment at home, adding screen filters and choosing low blue light bulbs can help to protect the vision of you and your family. Dr. Jonathan Beatty is an award-winning Doctor of Naturopathic Medicine with a family practice in Whitby, Ontario. He is also an expert natural health advisor and formulator for Prairie Naturals, one of Canada’s leading nutritional supplement and body care brands.